MARTIN COUNTY, Fla. — A local teacher is back home for the first time since being bitten by a shark Friday afternoon at Hobe Sound Beach. Chris Bryan, a math teacher at South Fork High School, says his injuries will take several weeks to heal. The avid surfer and diver says he has spent the majority of his life on the water. 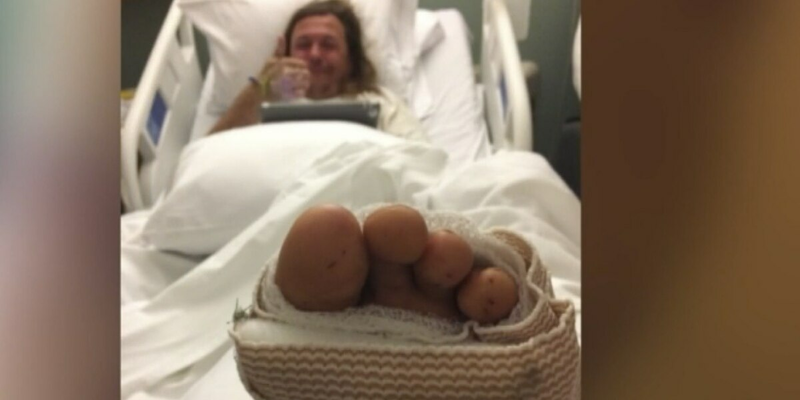 The shark bite will not keep him from going back in the water, but he says he did learn a valuable lesson. He said he was wrapping up an afternoon of surfing Friday, and caught one last wave to bring him to shore. He jumped off his board in chest-deep water. “As soon as I went in the water, it just grabbed my foot and was gone. The bite just happened so fast,” Bryan said. He knew right away what happened to him. “I’ve always seen sharks, just never been bit by one,” Bryan said. But, he didn’t know how badly he was bitten until he saw blood trailing behind him as he got closer to the shore. “I started calling for help and a couple of guys jumped up and started running down,” Bryan said. One bystander grabbed Bryan’s board. The other helped pull Bryan onto the sand. “The bystanders were just phenomenal,” Bryan said. Bryan said he briefly fainted as rescue crews were taking him to an ambulance. Once at the hospital, Bryan said he learned the extent of his injuries: A torn tendon and artery requiring surgery and countless stitches. “They ran out of suture material and had to send somebody out of the (operating room) to get some more,” Bryan said. He was released from the hospital Monday evening. There is one lesson Bryan now wants to share. Bryan says he is not sure what kind of shark bit him, but he believes it was a blacktip shark.